Spark plugs on the FRS/BRZ/86 twins are a little bit of an adventure. I'll outline how, when, and why to change them. For what it's worth, the manufacturer recommends replacing these every 60,000 miles. The car we changed plugs on was suffering severe drivability issues. Likely related to a bad ignition coil. However, it was well over 60k miles on the original plugs, so we replaced the spark plugs at the same time. 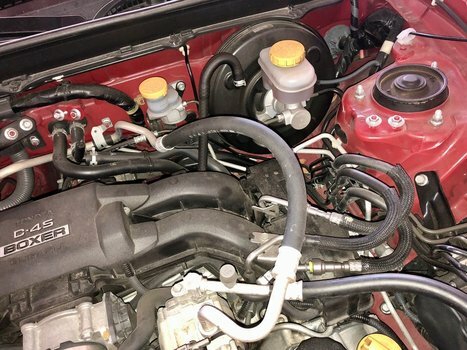 The FRS was having moments of extremely low power and breaking up at certain rpms, occasionally leaving the driver stranded for short periods of time. The FA20D engine uses a unique plug, supplied by Denso. The particular size, material, heat range, and shape requirements mean the plug is uniquely designed for this application. So, choices are few, and expensive (think economy of scale for manufacturing costs). If you didn't realize, the FA20 engine is a boxer design. That means the cylinder heads are horizontal - facing the sides of the car. 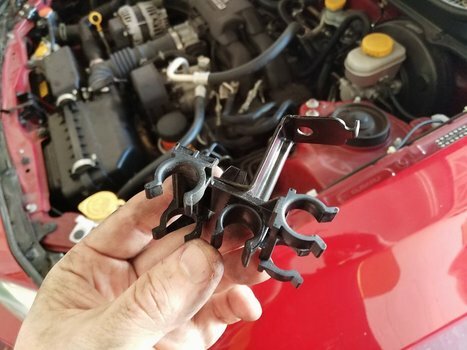 In in the case of the FRS & BRZ, leave you just about .05mm of space to access the spark plugs between the engine and the frame of the car. Toyota & Subaru maintenance guides suggest that lift the engine 4-5 inches to gain enough room to work. 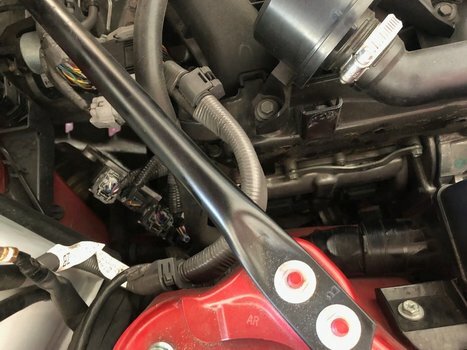 This involves removing and disconnecting quite a few parts and electrical connectors, so we thought we'd give it a shot without doing any of that. 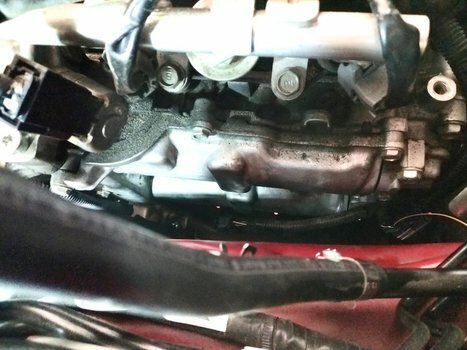 It took us approximately 4 hours - However, it was the first time we'd changed plugs on a boxer engine and the car was still hot when we started. Both slowed us down. Having done it once now, I'm positive it would only take an hour or so. We'll be messing with the injector computer and messing around near various electrical components. To keep yourself from accidentally shorting something or worse yet, shocking or burning yourself - disconnect the battery. This isn't really necessary, but it's easy to remove and it'll make your life a littler easier. They use 4 x 12mm nuts per bar, 2 on each end. If you have an aftermarket bar, I'd definitely remove that now so you don't have to work around it. Remove driver's side hose bracket. This bracket holds some hoses tight that'll get in your way a little. We need every millimeter, so 1 10mm bolt will remove the bracket. Just unclip the hoses from it and place it aside. Remove metal fuel injector cover. The cover is held on with 2 x 10mm bolts located at the front and back of the cover. Remove bolt holding the ignition coil on. Each coil has a single 10mm bolt holding it in place. 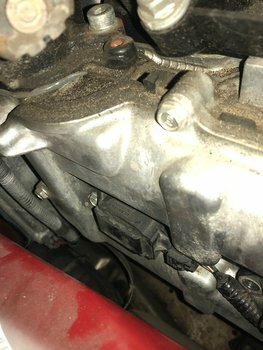 First disconnect the ignition coil connector. Just squeeze the clip and slide it off. The coil just snaps onto the spark plug. You'll be able to wiggle and pull it out, horizontally out of the cylinder head. Note that the coil is longer then there is space, you'll need to flex the rubber shaft to be able to get them out. Space is so limited, you'll have to do some tool juggling here. First, slide the 14mm deep socket into the spark plug hole, centering it over the spark plug. Now, carefully slide the 3" extension in behind the socket and gently snap it into the socket. I say gently because you'll want to avoid damaging fragile ceramic of the spark plug. At this point, the plug was still too deep to use my ratchet, so I added the 1.5" extension too. Now rotate and align the tool till the socket engages the spark plug. Now insert your ratchet and remove the spark plug (lefty-loosey). Again, due to the limited space, you'll need to remove the 1.5" extension before the spark plug is all the way out. Using just the 3" extension. Once it's fully unthreaded, remove your tools and fish the spark plug out by hand. Again, there's 4 x 12mm nuts holding the strut bar on. It's only slightly in the way, but it's easy and there's some space to be gained by removing them. The Injector ECU is in the way on the passenger side. It's just *2 x 10mm bolts. Remove the bolts and move the ecu out of the way. The wires are long enough, you should be able to rotate it back toward the firewall and get it out of the way. The injector cover on this side is just about the same, there's *2 x 10mm bolts holding it on. You'll need about 1 ft the vacuum hose. Slide one end of the hose over the terminal of a new spark plug and insert it into the cylinder head. 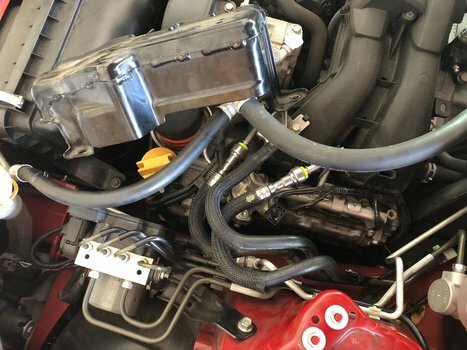 The hose will give you the reach and control to install the new spark plug without cross-threading the plug. You should be able to spin the plug a few times before it tightens up too much to use the hose. If it tightens up right away, remove and try again. Now use your 14mm deep socket and extensions to tighten the plugs all the way. The torque rating is 12.5 ft/lbs. You won't be able to use a torque wrench, so make sure you don't over do it. Install the coil by flexing the shaft and sliding it in over the spark plug. It'll snap in lightly when fully seated. (You may want to test how this feels with a spare spark plug). Re-connect the wire harness connector. Install the 10 mm ignition coil bolt. Don't over-tighten, they're only 6 ft./lbs. Install injector covers. There are 2 x 10mm bolts per side. Install injector computer (passenger side). Rotate the injector computer back in place and install the 10mm bolts. 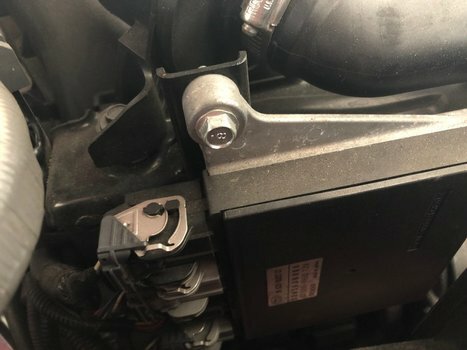 Install hose bracket on the (driver's side, 1 x 10mm) and snap the hoses back into it. Install strut braces. 4 x 12mm ea. 12 ft./lbs.